Sentence (a) is specific “to prevent adverse health effects“. Sentence (b) contradicts Sentence (a). There is no acceptable induction of electrical current. Current kills & inducing current increases cellular voltages using Ohm’s Law. 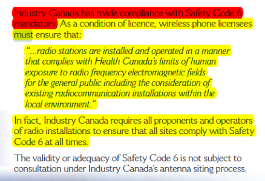 Here is the link to Safety Code 6(2009). The first 9 pages are alarming for their errors & omissions. Health Canada retained the Royal Society of Canada for their revision of Safety Code 6(2009). Why was FortisBC allowed to apply for wireless smart meters during the revision of exposure code? Professor Curtis Bennett’s 10 minute video presentation for Royal Society of Canada, deleted from the revision of Safety Code 6(2015). New and Existing Antennas MUST comply with Safety Code 6. No acceptable exposure or induction of electrical current. Cell Towers is deceptive language; there can be dozens of antennas for present and future use. Antennas are illegal and electrical contractors will be liable for powering antennas. Satellites microwaving the planet would also be illegal for their non compliance with Safety Code 6. The “science” used around the world for the safety of wireless and to bypass all jurisdictions is a plastic head or body part. It isn’t science. Copyright © 2019 Thermoguy. All rights reserved.